Grassy point, lakeside party, rehearsal dinner picnic, forest accommodations, guideboats, canoes, family, friends, flowers and fun. A little girl and her sisters, a summer home, a wedding dream, a dream come true. When the little girl grew up and planned to get married this childhood dream began to take shape. Mary and Justi decided to make it real. Growing up on the summer shores of Long Lake, Mary and her sisters spent their days in the forest, on the lake and in the mountains. Mary chose her wedding spot at an early age - a small, grassy spit of land, jutting out into the lake. With the high peaks on one side and the open lake on the other, Grassy Point stood ready and waiting all these years. The logistical planning for this wedding began a year in advance. 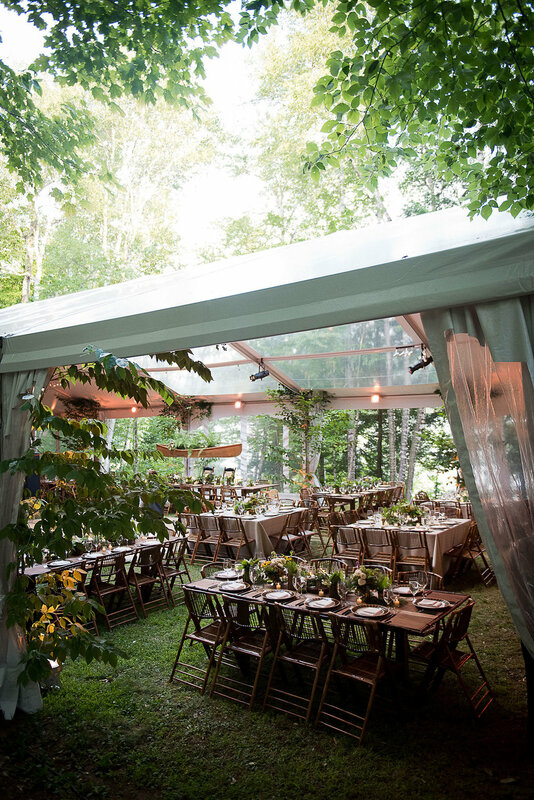 With a combined effort of Mary, Justi and families, local landscapers and caretakers, gardeners, Dan Mathiew - a Boston caterer and designer, and Perennia, all hands were on deck to turn this remote summer camp into a wedding paradise. Mary and Justi were adamant that they just wanted a simple gathering spot for friends and family to spend a weekend of celebration. 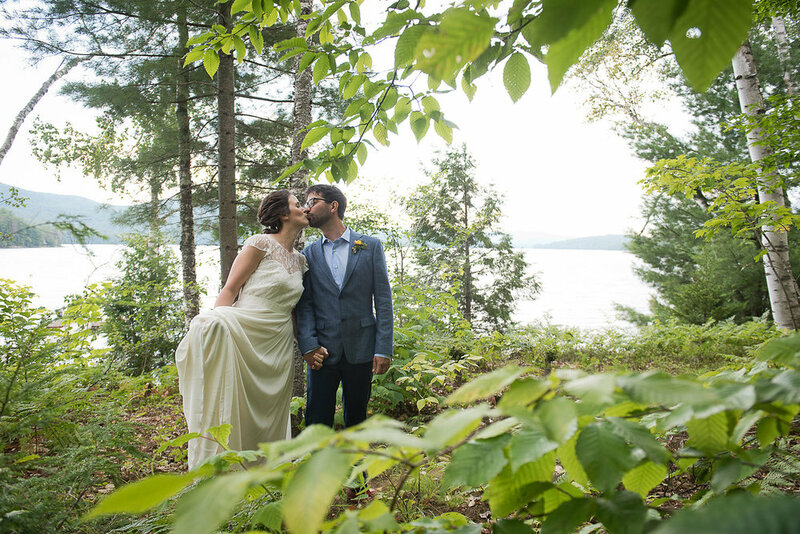 They wanted to share this incredible wilderness with their loved ones and get married too! Ah yes, a simple woodland gathering…And so it began…The grounds were trimmed, raked and pruned. 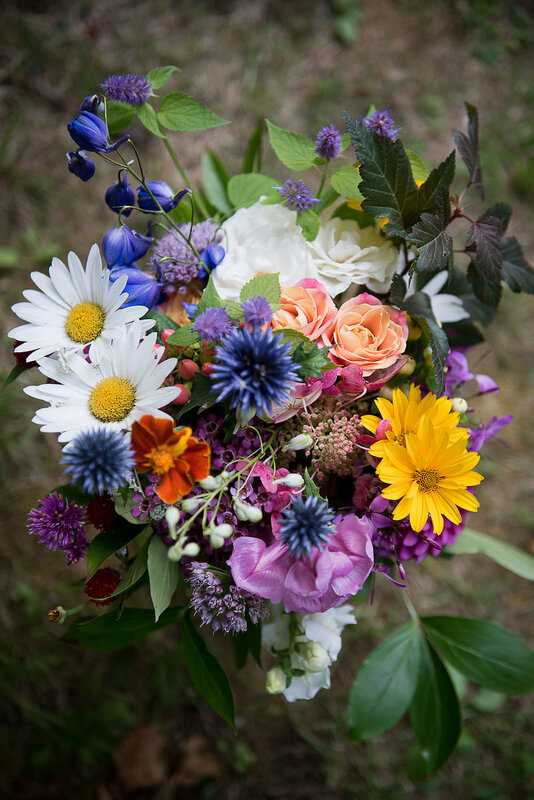 The gardens were planted with future wedding blooms. Log planters were brought in and set with summer seedlings, timed to blossom at just the right moment. The field was trimmed and groomed. High lake water from spring rains finally dropped. The path to the grassy point was trimmed and the beach was raked of spring debris. Wedding week brought increased threats of torrential rains. We carried on despite the dire weather news. All supplies had to be brought in via dirt road. Did I mention it was a long, long dirt road…? Thirty Glamping Tents (that’s glamour camping tents) were brought in and set up in the field above the lake. A huge base camp tent was erected and would become the center of activity as a guest meal tent and the site of the rehearsal dinner picnic. Shower and rest room facilities arrived, a huge fire pit was dug and string lights were hung all around the camping area. The caterer and fellow designer arrived and with him came the refrigeration trucks, ovens, genera-tors, food and staff. Tables, chairs, benches, linens, dishes… all arrived as planned. Extra canoes and kayaks, flashlights, blankets, bug spray, and outdoor supplies were put out for guests enjoyment. Hundred of tiny lanterns were hung on hooks and lined the path from the field to the lake. 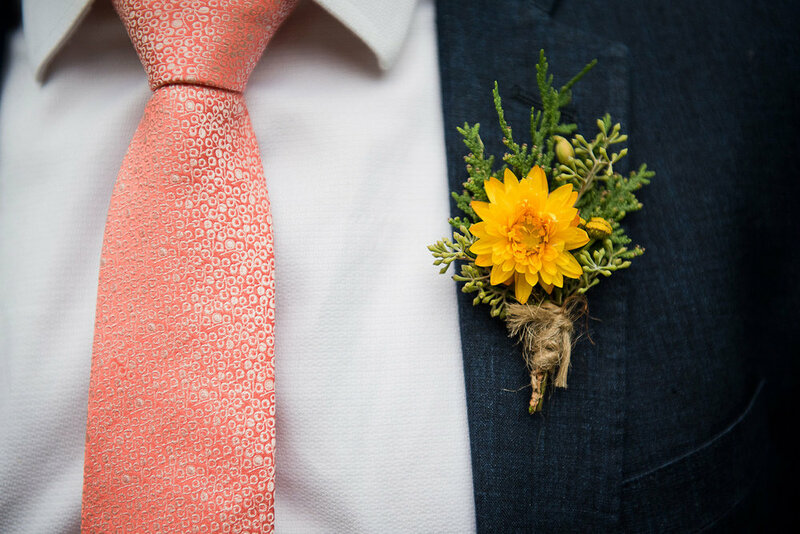 Meanwhile the Perennia team set up shop at the wood shed and spent the week prepping flowers, foraging for ferns and local greenery, cutting tree saplings and arranging all the floral and decor for both the rehearsal dinner and the wedding. Once the spectacular clear-ceiling tent was erected the real fun began. Handmade rustic tables were set with gifts from the forest floor. 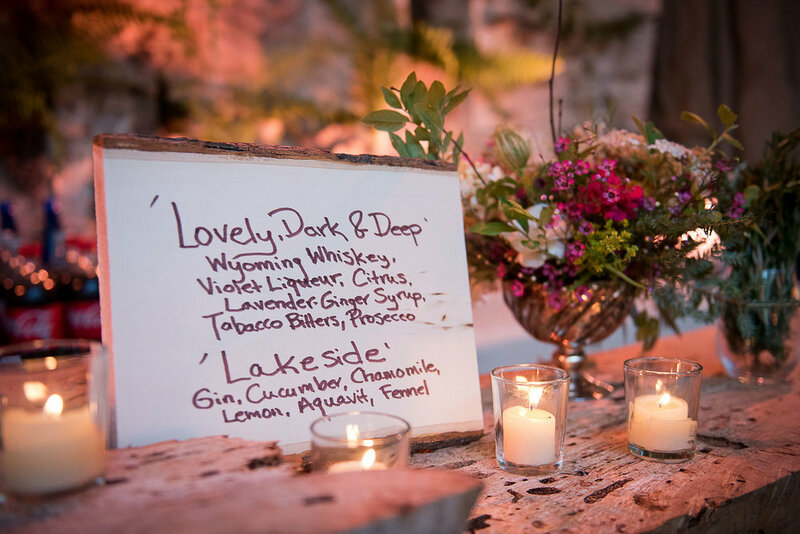 Moss, ferns, leaves and glorious florals adorned each table and were set with candles galore. The unique dishes and tableware fit the scene perfectly blending in and standing out all at the same time. The family canoe was hung above the head table and filled with buckets of fresh cut ferns. Of special importance was the barrier wall constructed behind the bar at the far end of the tent. Dan and his crew covered the wall with birch bark strips, ferns, moss, and twigs. They accented the wall with rustic driftwood found on the beach - a perfect ledge for votive candles. The bar was constructed with found wood and driftwood accents. As wedding weekend approached, the threats of severe thunderstorms continued. The rehearsal dinner on Friday night went off without a sprinkle and guests enjoyed a pig roast picnic in the mess tent. We decorated the tent with our own hand constructed farm tables and benches, wool plaid blankets, pillar candles, oil lamps and votives. As per Mary and Justi’s request, the tables were set with antique milk bottles full of wildflower bouquets and bark vases of leaves. Guests were treated to the traditional speeches, a slide show and a campfire with s’mores after dinner. Wedding day dawned sunny and bright but the weatherman continued with stern warning of severe and sudden storms. We anxiously watched the skies as guests enjoyed the beach, lake, and woods. Mary and Justi remained resolute in their desire to be wed out on the point so with only minutes to spare the decision to make the 3/4 mile hike was made. Umbrellas were shipped by boat, over to the point (along with guests who didn’t care to make the trek through the woods). And lo and behold, the looming storm dissipated, the mountains rose out of the clouds and the sun beamed down on Mary and Justi and their family and friends. 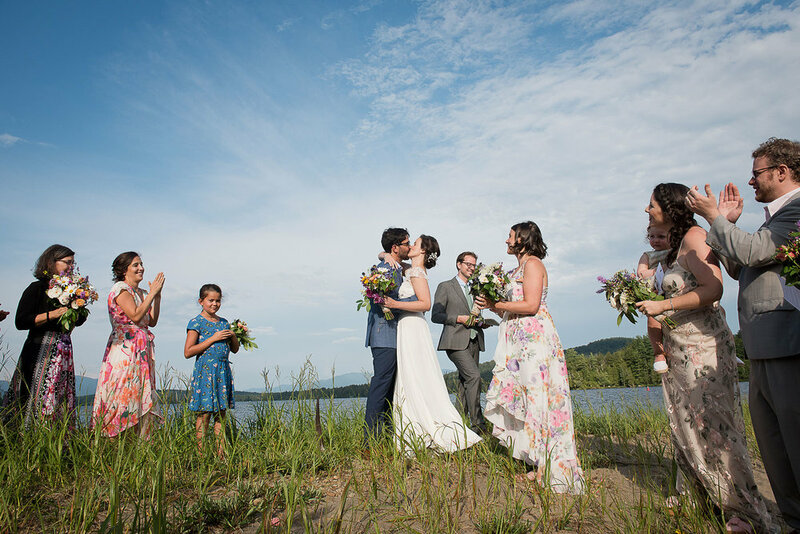 After a touching and heartfelt ceremony, the couple launched out on the lake to take a private boat ride as husband and wife. The rest of the crowd made their way back to the beach to enjoy cocktails set out on a rustic bar and a guide-boat full of tasty hors-d'oeuvres. Perfectly timed, the sun began to set and guests were called to dinner. 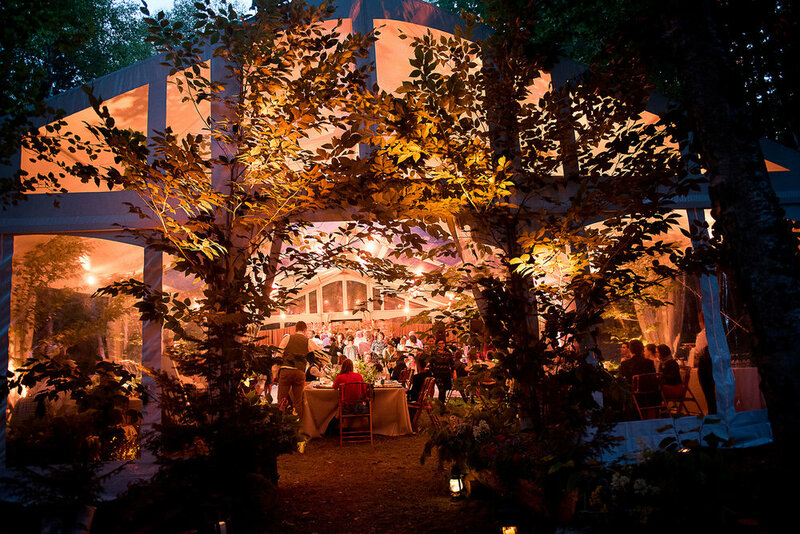 Entering the tent through a constructed grove of trees, flowers, lanterns, and candles the woodland magic continued. Candles flickered, dances were danced, a meal was enjoyed, cake was cut and the simple picnic wedding in the woods was a success!